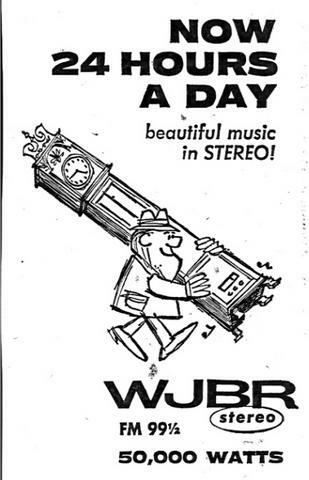 WJBR-FM signed on the air in 1956, broadcasting a classical & light music format. The phrase "Just Beautiful Radio" was used on the air. The format eventually evolved into 24 hours of beautiful music and the station used as a nickname "JBR 100". WJBR-FM 99.5 was founded in 1956 by a father and son team of John B. Reynolds, Sr. and John B. Reynolds, Jr. John, Sr. was co-owner of a local service station. It was John, Jr. that had the history in broadcasting and music. Jr. hosted a local TV dance program (before American Bandstand), and was a recording pianist in the late 1940's. John, Sr. began the radio station because John, Jr. was a strong believer in the future of FM. The station operated with only five employees for the first few years. John Sr. did some selling and Jr. operated as General Manager, Program Director and voiced many of the commercials. The other employees were booth announcers who also played the music.